Now that we’re coming up on the winter months, I’ll be getting a ‘stash’ of onions, celery and carrots into the freezer so that I’ll have them handy when I need to make another round of this delicious-wonder-pot. 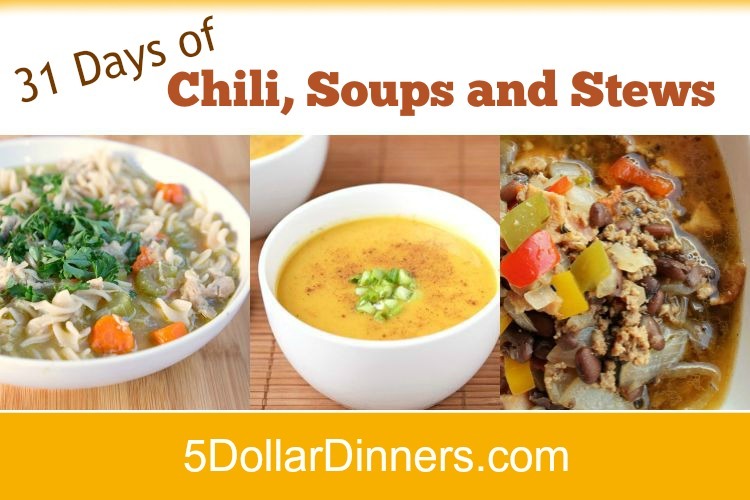 It’s easy to freezer carrots, celery and onion when you know you’ll use them later in a soup, stew or chili. Simply combine a batch’s worth in a plastic container or baggie and freezer them to use later. There’s no need to give them an special pre-freezer treatment…just toss them in and freeze them. When you’re ready to use them, you can just drop them partially frozen or mostly frozen into the cooking liquid and let them melt into whatever it is you’re making. 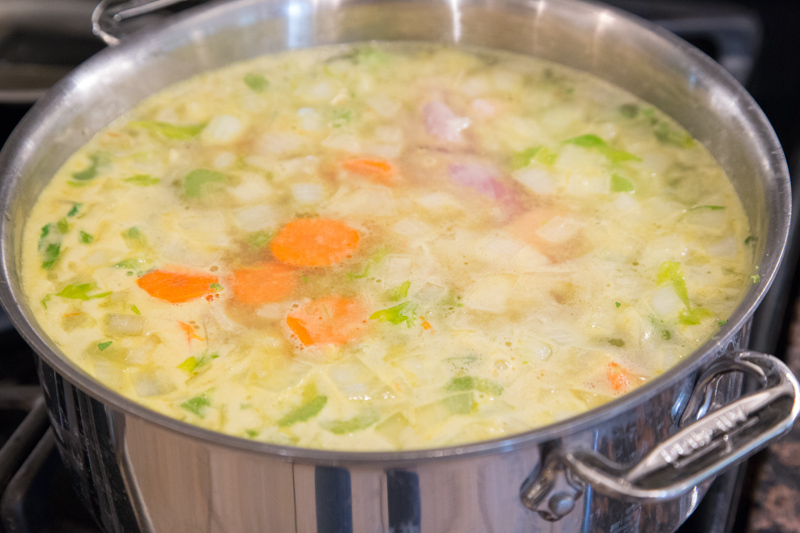 Ok…so back to this recipe…it starts with the carrots-celery-onions. Then moves to the stock and chicken. And at the end we introduce the pasta just before serving. Saute these veggie-babies together for a few minutes, until the onions start to sweat. Then pour in the stock and add the chicken. I removed the cooked chicken from the pot and added it to my stand mixer to shred. Once shredded, I added the chicken back into the pot. If need be, add 1 cup hot water. Let cook for 8 to 10 minutes, or until pasta is al dente. You don’t want the pasta to overcook by letting the pot sit on the stove too long. 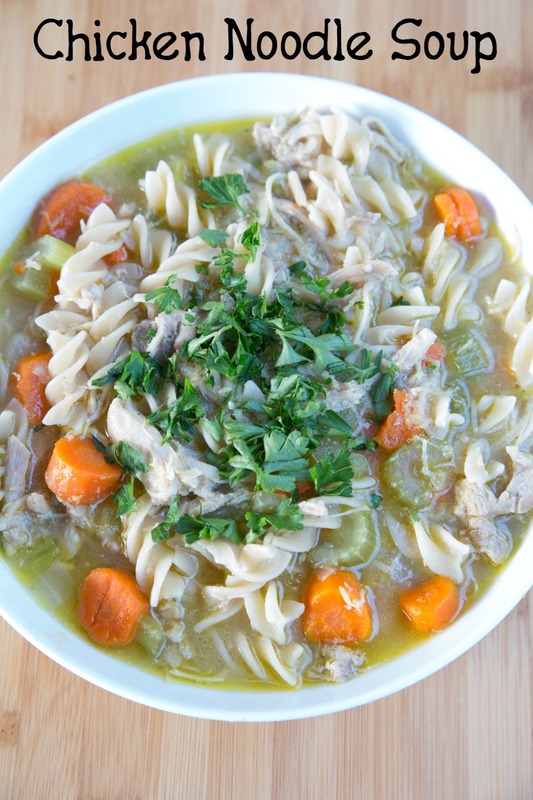 Serve Homemade Chicken Noodle Soup with fresh parsley garnish. 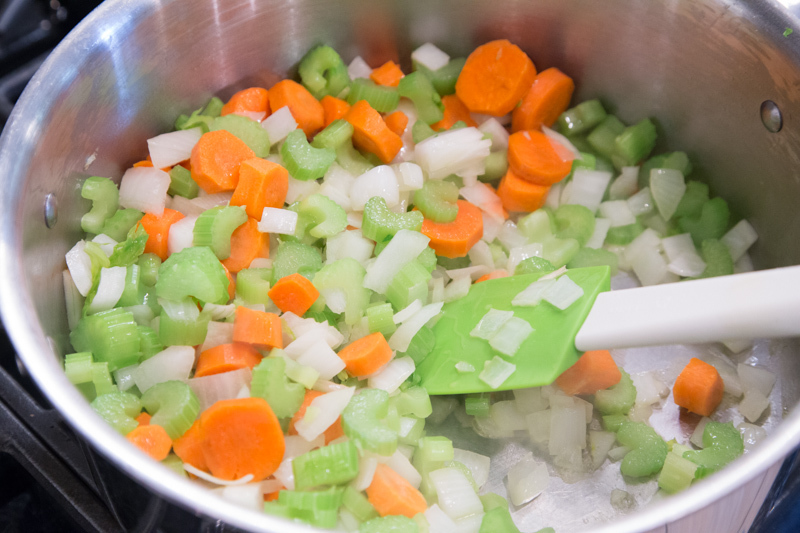 In a large saucepan or stockpot, add the olive oil and saute the carrots, celery and onions until the onions begin to sweat. 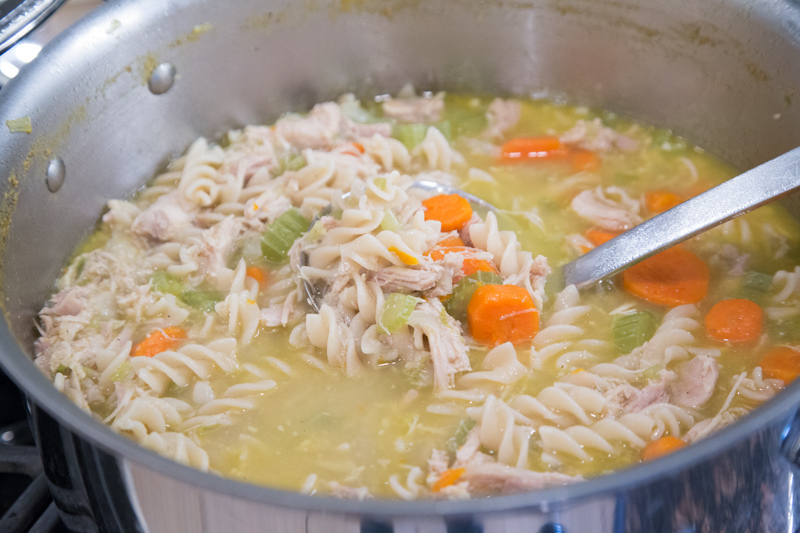 Pour in the chicken stock and bring to bubbling. Cook the chicken thighs in the stock, with lid covering the pot. 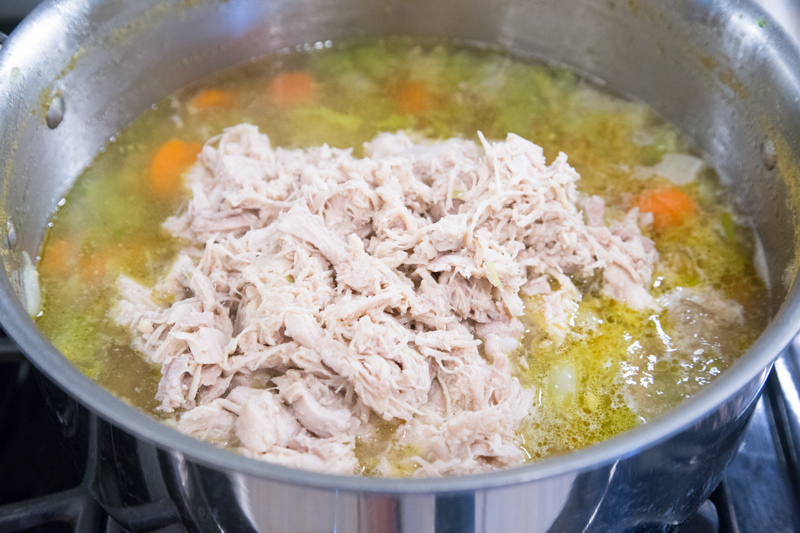 Once completely cooked, remove the chicken thighs and shred with 2 forks, or in a stand mixer. 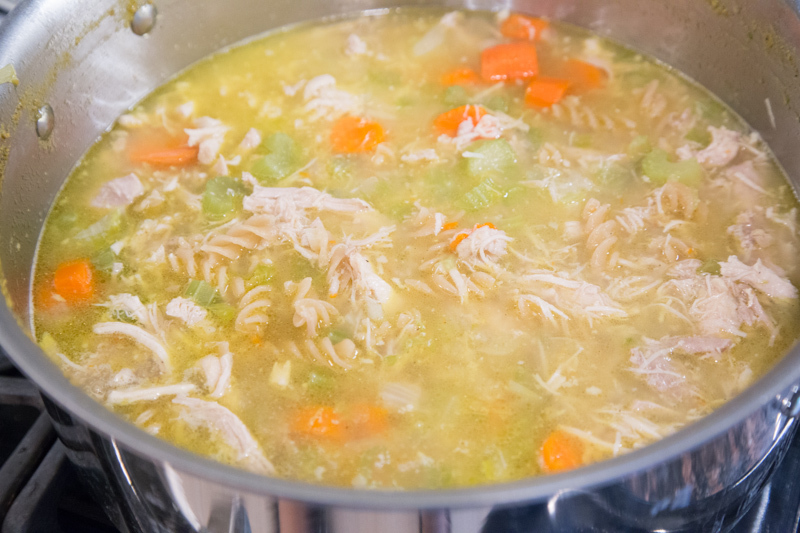 Return the shredded chicken to the pot with the veggies. Return to simmering/slow boil and add the pasta noodles. Add in the garlic powder, dried thyme and salt and pepper to taste. (If it appears that most of the pasta is sticking out of the liquid, add 1 cup of water for the pasta to absorb.) Cook at a rolling boil for 8 minutes, or until al dente. 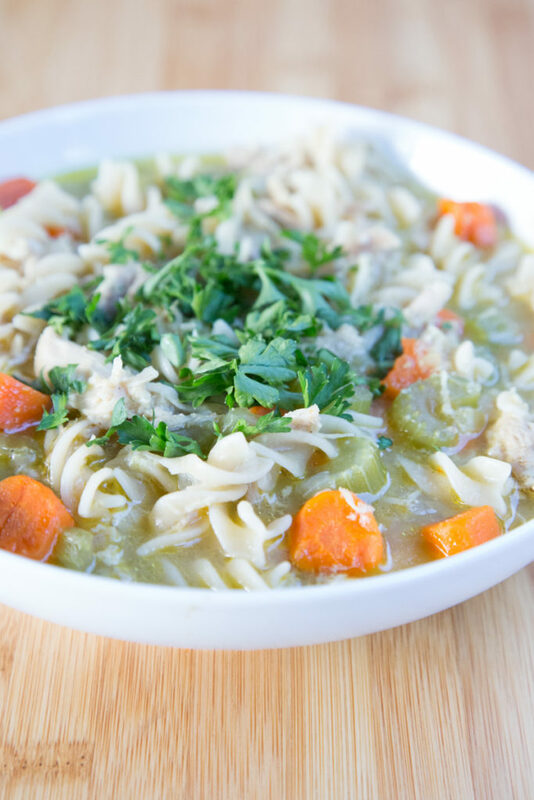 Remove the pot immediately from the stovetop and ladle soup into serving bowls. 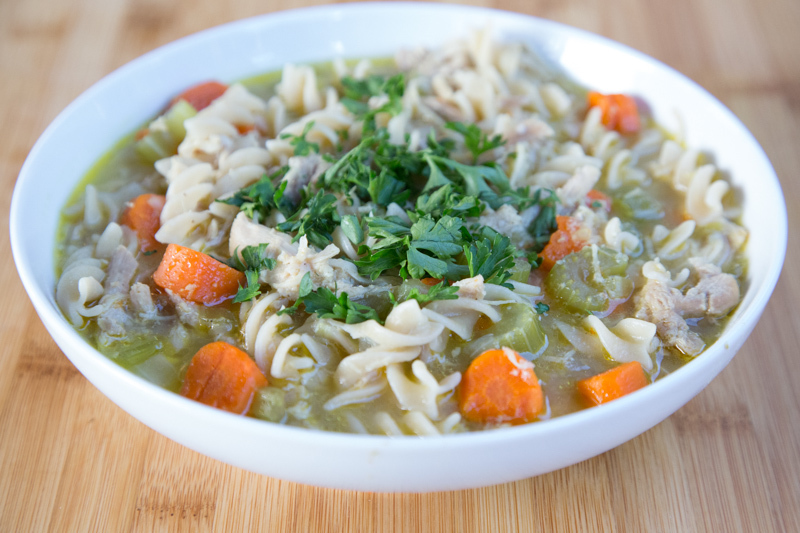 Serve Homemade Chicken Noodle Soup with parsley garnish.